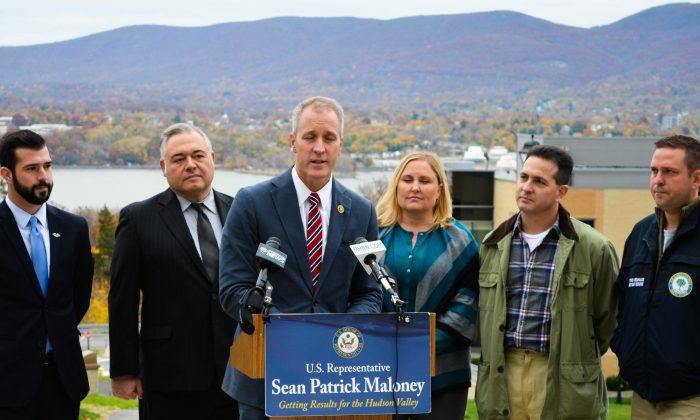 NEWBURGH—Congressman Sean Maloney (NY, 18) arrived on the campus of Mount St. Mary College on Nov. 7 to highlight legislation that revamps and streamlines the VA’s Veteran Rehabilitation and Education program for disabled veterans. Called the Wounded Warrior Education Improvement Act, the bipartisan bill is expected to pass the House within weeks. Maloney says the VA is not adequately caring for vets who need work. Maloney says vets who have been wounded in combat have an unemployment rate of 18 percent. “That’s crazy in a country where unemployment is now 5 percent and unacceptable”—and higher than unemployment for other veterans. No one should fight for their country and come home and have to fight their government. The General Accounting Office studied the problem and found that it can take six years for a disabled veteran to navigate through the system for job opportunities. A caseworker may have 200 cases to handle. Maloney’s bill requires the Secretary of the Veterans Administration to report on a way to streamline the program by reducing the caseload and training department employees on the issues plaguing disabled vets, such as PTSD and traumatic brain injuries. To contact this reporter, please email yvonne.marcotte@epochtimes.com.